It’s time for Scott’s favorite part of the week, the episode where he gets to answer your Amazon private label questions on the show. Today’s episode is filled with questions from real Amazon sellers who are in the trenches, building their own business to benefit themselves, their family, and the world. 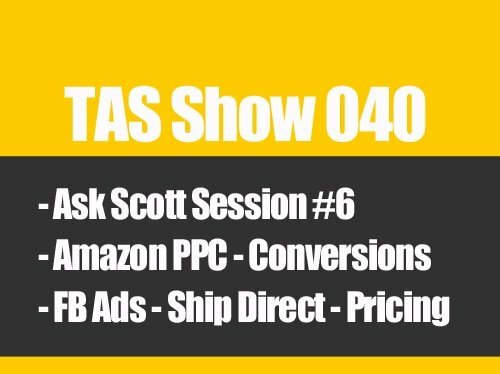 Today Scott answers questions about choosing a second product, aiming at a particular market, shipping to Amazon USA when you live in a different country, maximizing your PPC (Pay Per Click) campaigns, and how to use Camel Camel Camel. It’s all on this episode of the podcast. I’ve heard people say that launching a second product is a good way to increase sales, is that always true? The short answer is, “No.” A second product has to be researched effectively and tied into your current product line to make the most sense and give you the most return on your effort. You can’t expect to simply pick a product, set it up on Amazon, and see sales come in. It simply doesn’t work that way. It makes a lot more sense to research your market and to develop a uniquely branded product line within the market that feeds from one product to another within your brand. That way you can promote cross sales and related items to people who are already familiar and happy with your products and brand. I don’t live in the U.S. How can I have my Chinese supplied products shipped straight to Amazon instead of to my home? A caller has heard that it makes sense to have your products from China shipped to your home before you send them to Amazon so that you can inspect them and assure that the quality is as you wish. But what if you don’t live in the U.S. but are selling on the Amazon U.S. site? The answer is to find an inspection company that can go on site to your supplier and inspect your products to ensure their quality before they ship. It’s an added expense and an added step, but it is a great way to enable your supplier to ship directly to Amazon and ensure that the quality of your products is high as well. My Pay Per Click (PPC) budget is used up in the first day. What am I doing wrong? If you’re running a PPC campaign where the daily budget runs out quickly or almost immediately, you may have a very good problem. What’s happening is either one of two things: #1 – You’ve allotted a very small amount and it’s running through it quickly – in which case you’d need to increase your daily budget. OR #2 – There are many people searching for your target keywords and clicking on your ads as a result. How do you determine which it is and what can you do to take full advantage of it? 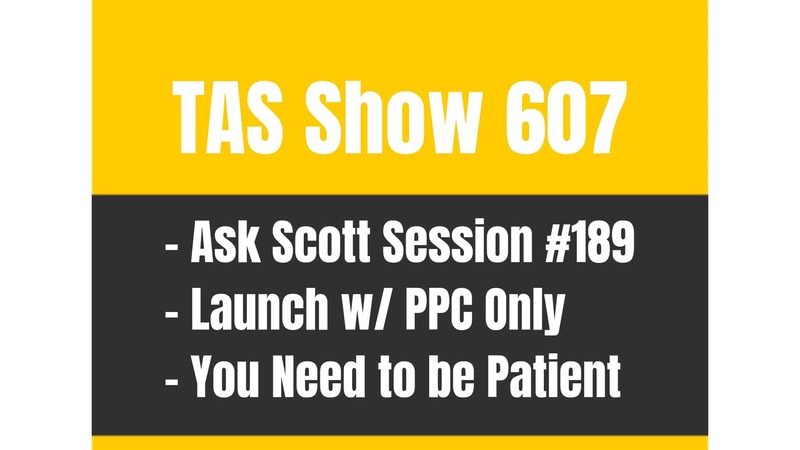 You’ll find out on this episode of The Amazing Seller when Scott answers a listener question about PPC. A great tool you can use to validate data about a new product idea. When you’re considering a new product, it’s easy to be misled by the initial research. The numbers can look very good at first until you dig a bit deeper. You want to use tools like www.CamelCamelCamel.com to look into the sales history and other facts surrounding similar products before you take the plunge. You can learn a lot that could save you from making a mistake that could cost you thousands of dollars. You can hear Scott’s description of how to use it effectively on this episode of the podcast. [1:33] Why it’s important to move past your fear. [2:05] How you can get transcripts and show notes. [2:36] QUESTION ONE: I’m a bit confused about the criteria for launching a second product. [7:59] QUESTION TWO: I’m in Amsterdam. How can I get my products shipped to the U.S. in the most effective way? [10:51] QUESTION THREE: I ran out of PPC budget within the first two days. What am I doing wrong? [14:20] A BONUS TIP: The Google Chrome extension from Camel Camel Camel. [15:38] What is Camel Camel Camel? [16:30] Why you need to validate data around potential products. [00:00:03] Scott: Well hey, hey what’s up everyone. Welcome back to another episode of The Amazing Seller Podcast, this is episode number 226, it’s session number 67 of Ask Scott. This is where I answer your questions here on the podcast and all you have to do to ask a question is head over to theamazingseller.com/ask and you can record a voicemail right there. ….some of you haven’t but it’s okay, but please do that. I want to know who I’m speaking to and then also just leave a brief question and that’s what we’re going to do today. You guys all know this is a highlight to my week and I get pretty fired up to actually answer questions from you the listener. Now this is kind of strange doing this episode I got to be honest because I’m just a few days from the move all the way from New York to South Carolina but you’re listening to this, you should be listening to this around July 8th. I’m recording this a little bit early so this way here I have enough time in between the moves so it’s a little weird because when you listen to this I will be in South Carolina. It’s kind of strange to see myself there right now because it’s quite a move and we’ve been crazy getting ready for this thing. I want to also just say everyone that’s either emailed me or reached out on twitter or Periscope or wherever and have wished us good luck wishes I just want to say thank you, it means a lot. [00:02:03] Scott: I want to remind you guys of the transcripts and the show notes, every episode now has them so you can go over and check them out. This episode is 226 so you can find them by heading over to theamazingseller.com/226 and you’ll find all the show notes and the transcripts there, right there at that link. Again just to remind you guys, all you have to do to ask a question is head over to theamazingseller.com/ask and record you message. Guys what do you say, I’m fired up. I’m ready to dive into today’s questions so I hope you are so let’s go ahead and get to it. What do you say? Let’s listen to the first question and I’ll give you my answer. [00:02:48] Brian: Hey Scott, it’s Brian, A-MA-Z-I-N-G, amazing podcast and I’m just been massacring through all these episodes and I have just about 6 or 7 left to go so keep them coming. I do have a question that I think that hasn’t been addressed yet. I remember how you mentioned that if you launch your second product then your first product will nearly double in sales because every new product launch will help the products before it. What if the second product has a lot of competition, is it still a good product to launch or only launch products that have low competition, meet Greg Mercer’s criteria in where there’s wiggle room to get a lot of sales? Thanks a lot and look forward to your answer. [00:03:29] Scott: Hey Brian thanks so much for the question and it’s a good question. Now I don’t want people to think that if you launch one product and then you immediately launch another product that you’re going to start getting more sales. That’s not really what I mean. Here’s what I mean. Some people will launch a product in let’s say the garden niche and let’s say that you launch that product, let’s say it’s a gardening shovel. Then the next product could be like a little mini garden rake or maybe a holster for the shovel or a little bag for the bucket or whatever. There’s all of these other products that go hand in hand with that product line. If you launch a shovel and then you all of a sudden pivot and now you launch a garlic press well that’s now really going to help the sales. What I meant by that and what I mean by that and I still stand by that, is when you’re creating a brand, on Amazon, off Amazon it doesn’t really matter. When you have more products for your customer to purchase it’s pretty much going to happen naturally that your average sale is going to increase. Amazon does a really good job of this because what they do is they show frequently bought together, suggested, all of that stuff. You can also advertise on your key words that then are also going to kind of piggy back off of each other. You can run promotions inside of your own listings so this way here you can run a special to your other listing inside of the one and back and forth through those different products. That’s what I meant by if you launch one product and then after you launch product two your sales could increase, they could double, doesn’t mean they’re going to. They definitely should spike because now you’re giving that one customer more things to buy. It’s kind of like I kind of go back to the fisherman, if you’re a fisherman well you need a tackle box, you need the gear that goes inside the tackle box. You might need some boots, some weighting boots, you might need some hooks, you might need maybe a hat, maybe you need, I don’t know certain thing, a pair of pliers to take off the hooks, whatever it is. [00:05:41] Scott: There’s different things that are positioned to go towards that particular customer and that’s what I really do talk a lot about and I’m going to be talking about even more is really not going after the product but going after the market because if we can go after the market then we’re able to figure out what that market wants and then we can give it to them. Again if we’re going into the gardening space well someone needs the shovel, they also need the little mini rake, they also need the bucket that the bag slips over, that little five gallon bucket with the little compartments in it and then they might the need the little pads so they kneel down so they’re doing the gardening. Then from there they might need, I don’t know those little clippers that they can clip off, kind of prune the shrubs. All of these different things can go in that bucket so it’s almost like you’re filling out that bucket with all of those other tools that they are going to have to buy when they’re doing it. If someone is buying one tool they’re probably going to want to buy the other tool. That’s just an example of how you can build a product line and that will usually increase your sales especially if you market it properly. Again I think that you should always have those promotions being cross-promoted inside of each other. Now this would work really, really well if you had an external sales funnel. We’ll get into that a little bit later at another time but really think about this; someone buys your shovel on your e-commerce site and then you can control the next part of that sales funnel meaning that the next thing will be like, hey before you go we’ve got a special on the garden rake. Before they go, “Oh we’ve got a special on the pocket that goes over top of the bucket that holds the tools.” You can lead them through that buyer sales funnel and same thing kind of like if you’ve ever been on godaddy.com and you bought a domain name they do it very well. Vista print is another one. They’re giving you relevant products kind of geared towards the one that you just bought. It’s a natural progression. Amazon does that but they control it but it’s still going to help your sales. Hopefully that’s helped you. I can go on and on about that stuff because I think it’s really important but again let’s think about the market, what are the problems or the things that the market needs and wants and then serve up those things to the market. All right, let’s go ahead and listen to the next question and I’ll give you my answer. [00:08:03] Simon: Hi, my name is Simon, I live in Amsterdam. I hear a lot of people say they ship the products to their own home, all of the people that I hear are from the US. For me the shipment of the products from China to Amsterdam and then over FBA in the US seems like a big waste of time and money. Could you expand please on how people get around this or what the alternatives are to that? That would be great, thank you very much. [00:08:38] Scott: Hey Simon, thanks so much for the question all the way from Amsterdam, thank you for that long distance question. That’s awesome. Here’s the deal. When we talk about getting stuff shipped to our own location it really does mean in that same country that’s going to make more sense. I would not say for you to order something have it shipped to Amsterdam and then ship it back into Amazon FBA in the States. That just wouldn’t make sense. The work around to that is you would have to have a third party Inspection Company the one that I recommend that I’ve heard really good things about, all my students are really using this one company, it’s topwininspections.com. Again if you guys want the resources or even the show notes you can find that all on this episode. I’ll put the links and the different resources on this particular episode which is 226 or you can head over to the resources page and you can find that link over there, theamazingseller.com/resources. You’re going to want to do that. What they’ll do is they’ll act as your inspector and they do a really good job so this way here you might pay a couple hundred bucks for them to do it on your entire order but then they’re going to give you a report, they’re going to give you pictures, they’re going to let you know if there’s any problems before you ship it in because that’s what we really want here. That’s what we’re doing, that’s what I’m doing when I ship stuff here to my home office is I want to be able to inspect it to a certain degree. Now I’m moving in the direction where I’m going to start shipping stuff direct but it took me a little while to trust the process because again once you ship stuff into Amazon you don’t know if anything is wrong with it until you start getting complaints from customers and that’s scary to me. You have to have a little trust in your supplier but once you do an inspection I believe that from there you’ll be able to get that trust. Also a little side note is when you tell your manufacturer that you’re going to have it inspected they will probably do a better job of QC-ing it, quality controlling it. That’s what I would recommend. [00:10:37] Scott: I’ve got a bunch of people right now that either listen to the podcast or that are in my class that actually use an inspection company and they swear by it. That’s what I would recommend for you Simon. All right good luck to you and keep me posted on your progress. Let’s go ahead and listen to another question and I’ll give you my answer. [00:10:56] Margaret: Hi Scott, this is Margareet and I’m in New Jersey. Glad to hear another person from the metropolitan area. My question, I started pay-per-click and I’ve run out of budget in the first two days. What I’m wondering is am I causing myself to run out of budget because I’m obsessively clicking on my listing and using terms to try to locate my listing? Thanks for your help. [00:11:21] Scott: Well hey there Margareet thank you so much for the question from New Jersey and yes I am kind of in your area but guess that when you’re listening to this I will not be in your area, I will be in South Carolina. Just want to say that I am going to be living in the Carolinas which I’m very excited about. New York has treated me over the years, a little too much snow for me and that’s why I’m leaving. Taxes are a little higher but I’m going to get out of here but I’ve been to New Jersey and it’s a nice area. Okay let’s talk a little bit about this pay-per-click thing. Number one if you’re going out of budget in a couple of days or each day you’re going out of budget that means that you have quite a bit of traffic. My first thing is to look at those keywords and make sure that they’re not too generic meaning that they’re not just like one word that’s getting a ton of traffic because it’s not specific enough. I would rather be more specific and get less impressions and less clicks as long as they converted better. Now running out of budget that’s great as long as you’re getting those clicks and as long as they’re turning into sales. Not all of them but the ACOS, the average cost of sale, as long as that is in line with how you’re running. If you need any help on pay-per-click we have done some episodes in the past, I have a quick start little guide that I created, you can find that at theamazingseller.com/ppc. The other one is episode 119 that’s theamazingseller.com/119. I did that with Chris Shaffer. That one there we talked a little bit deeper about the new features and stuff and kind of like how to get yourself setup and start looking at the data. Going over and talking about now you clicking on the ads. I don’t believe, I could be wrong, I don’t believe that you’re going to be able to click on your ads multiple times going from the same IP address. [00:13:23] Scott: I believe Amazon will kind of see that because then also what could happen is you could have a competitor that just kept clicking on your ad over and over again and then just driving the price you go out of budget. I don’t believe that Amazon would allow that to happen from the same IP address so I wouldn’t worry too much about that but you want to even contact seller support on that and see what they say but I don’t think you have anything to worry about with that personally but I would say I would not start clicking on my own ads. If you’re going to search for your product I think that’s fine but I wouldn’t like search your product and then just keep clicking your product in the organic or the page search. I would just go directly from inside your back end of your seller’s account. Hopefully this has helped you, thanks so much for the question and go check out that pay-per-click resource that I gave you either episode 119 or the other one, the short link for that one is theamazingseller.com/ppc. All right guys, I have one more person that I want to share with you that didn’t share a question or ask a question but more of less shared a tip so I’ get him play or I’m going to let this message play and then I’m going to comment on it. Let’s go ahead and listen to this pretty cool little tip. [00:14:35] Dennis: Hey Scott, Dennis here form Northern Kentucky, I just wanted to give you a tip not really ask a question. Often times you tell people to go visit camelcamelcamel.com to look at sales history and price and things like that when they’re researching products. That’s an extra step that’s not necessarily a necessary step. This tip could save some people trouble or some time and save them that trouble of having to leave the website. Camelcamelcamel.com has a Google chrome extension just like jungle scout does. If you install that when you’re looking at any Amazon page it will show down at the bottom the camelcamelcamel graph already on that listing page. You don’t have to leave Amazon to go look at that data that you’re searching for. That’s my tip, camelcamelcamel extension for Google chrome. Enjoy and press on. [00:15:34] Scott: Hey Dennis thanks so much for the quick little tip here and that is a pretty cool little tip. For anybody that doesn’t know what camelcamelcamel.com is, it’s a website that allows you to take a link or an ASIN and plug it in to their software it’s free, you go on there and it will give you some data. It will give you some history, it will give you some sales data, how their price has fluctuated, how long they’ve been selling. It’ll give you all graphs and all these kind of cool things. It’ll also give you the BSR over time so it’s a really cool little tool. But what Dennis is saying here is that instead of going over to camelcamelcamel.com and then plugging it in there’s an extension inside of Google Chrome that I wasn’t aware of that you can use. Yes that is something that I’ll definitely be looking into as well, that sounds pretty cool. I know that Jungle Scout also has one built in, I don’t believe it for camelcamelcamel, it’s for another similar software. Google trends they also have built into Jungle Scout so that’s another cool little thing. Again I would recommend anyone that’s exploring products to definitely go check out camelcamelcamel.com because that right there is going to give you some history because a lot of times we’ll look at Jungle Scout, we’ll look at the surface and the numbers look really cool they look good. Then when we dig into the history of it they might have just launched their product. I’ve talked about this before but I need to talk about it again because it’s really, really important that you understand that. I actually did an episode, episode 189 that talks about depth and demand and using camelcamelcamel.com and using Google trends to really see about seasonality and then also just see if the numbers that you’re seeing in Jungle Scout as far as like they look good but are they just good because they just ran a promotion? We can get fooled by those numbers. I always kind of go through that process that I share in episode 189 where I take the data from Jungle Scout and I go okay this looks good and then I will run it through kind of like my validation test to see if the product was just launched, if they just ran a promotion or maybe they’re doing some other type of promotion. [00:17:51] Scott: You can tell because they just launched the product. If they’re selling, I’ll give you an example, if they’re selling let’s say 800 a month but you look at the history and they just started selling like two weeks ago, maybe it was a little bit longer maybe it was a month ago, even at that that would have raised a red flag for me because they probably did a pretty big push in product to do a promotion. I’d want to look at that stuff. I need to see at least three, four months of someone actively selling and then seeing that they went through a promotion phase and then the sales kind of leveled out and then that’s where I’m going to look and want to pay attention to is where the sales leveled out. Really, really important though that you run it through that. Great tip Dennis, thank you so much for that so I’m going to definitely check that out. I guess it only works in Chrome but that’s okay Jungle Scout works in Chrome as well but just use Google Chrome, I love that browser. Guys that’s it, that pretty much going to wrap it up. I did want to remind you a couple of different things, one is if you have a question you want me to answer on an upcoming show just head over to theamazingseller.com/ask and you can ask your question there, just leave your first name and a brief question. Also go over and connect on the Facebook page. We have a TAS Facebook community which the time that I’m recording this we’re just under 30,000 but I’m probably going to guess that if you’re listening to this right now we’re probably up over the 30,000 mark because there’s a lot of people coming in every single day. A great resource, a lot of great people in there, a lot of people sharing, likeminded people, go check it out theamazingseller.com/fb and you can go over there and get all of the conversations. You can kind of listen and see and ask questions and all that good stuff. All right that’s it, that’s going to wrap it up. I want to remind you guys that I’m here for you, I believe in you and I’m rooting you but you have to, you have to… Come on say it with me, say it loud, say it proud, come on, “Take action.” Have an awesome amazing day and I’ll see you right back here on the next episode. Have a good one you all. www.TheAmazingSeller.com/189 – Episode about product validation data. Still going with Top Wins Inspection or Guided Imports?